It’s newsy, it’s trending, it’s the talk of the town – yacht safaris in Mozambique are exclusive – you can sail the Quirimbas and the Bazaruto Archipelagos, the landscape your oyster. Dive, kayak, snorkel in luxury – try us for the best prices online! Have you ever considered a holiday that takes you to see amazing Mozambique islands where your key transport mode is an elite yacht, your home for a few days? Have you ever imagined sailing into the blue of sea and sky, knowing that you are in good hands and that you will see so much open space and beauty it will be mind-boggling? Mozambique yacht safaris into the Quirimbas and Bazaruto Archipelagos are certainly for the privileged few, but we want to bring them to you at great prices so watch out for our amazing special packages. It seems that wealthy travellers are increasingly arriving by luxury yacht or liveaboards to explore this relatively untouched playground where 32 Quirimbas Islands, in all their exquisite remoteness, are becoming more accessible. Here, “yachties” can have their own space, on water, and spend their days swimming, snorkelling, diving, kayaking and lazing on dazzling white beaches. And, to crown it all, the region is known for its fascinating history and culture, attracting all kinds of travellers to sample its treasures. A holiday on one of the Quirimbas Archipelago islands will probably be the best decision you make all year. Combine your sailing safari with a few days on these remote islands, off the coast of northern Mozambique close to Pemba, still relatively untouched with the Indian Ocean around them a diver’s paradise. Book a special island package to Ibo, Azura Quilalea, Matemo or Medjumbe Islands and be surprised by the wondrous settings, white beaches and sparkling clear blue seas! Once known as the Islands of Lazarus, the Quirimbas Archipelago is brimming with history – Arab trading posts and Portuguese trading routes dominated these seas many decades ago. Take Ibo Island for example – architecture here dates back to the 1500′s when forts served as military bastions and slave trading houses lined the shores. Today, Ibo is a melting pot of influences from Africa, the Arab region, India and Europe. And your yacht will berth here for a few days while you breathe it all in! The best part about being yacht-bound in the Indian Ocean off Mozambique is that you still have everything at your fingertips – fresh food, clean linen and towels, access to water sports at no extra cost including kayaks, snorkelling gear, diving equipment, fishing tackle and more. 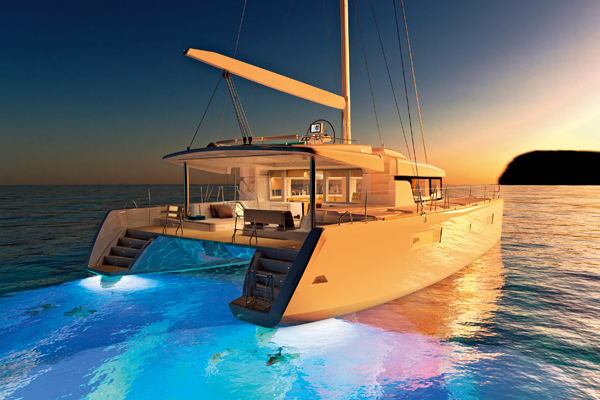 Mozambique Yacht Safaris offer the discerning client a sea voyage on board unique Catamaran Yachts which sail to these destinations in style. These carefully selected private charters allow you full use of the entire boat for your group of friends or family. Not only do we provide an experienced skipper, expert deckhands and a highly regarded chef on board to cater for your every need, but so too do our luxury yachts come fully licensed with all the required certification. Our well equipped, purpose-built Catamarans offer a total of eight guests the opportunity to go diving, snorkelling, fishing, or simply exploring the warm clear waters of the Indian Ocean in an island hopping style. It is worth noting that the yachts are all privately owned and leased for the sole purpose of our spectacular Mozambique yacht charter holidays. None of the yachts is identical and is therefore subject to availability. 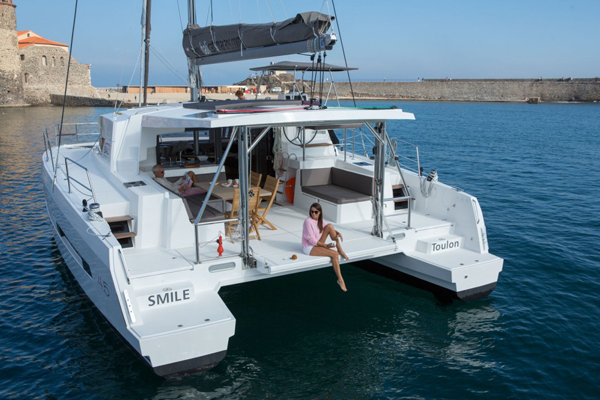 We at Mozambique Yacht Safaris have chosen the Lagoon 52 Catamaran thanks to its stability and style. We like the sturdy quality of such yachts which are usually loaded to the hilt with all our necessities for a holiday in paradise. When you need to live on board a yacht for a week at a time you need space, manoeuvrability, luxury and comfort – this includes ideal ergonomics too. These yachts can offer three to five cabins for guests and their environmentally friendly design ensures that they perform well in high seas and on hot days too. When the wind is up, she performs amazingly well under sail! The Lagoon 52 is a very safe yacht for your Mozambique safari. She has wide side decks and is easy to board and disembark. 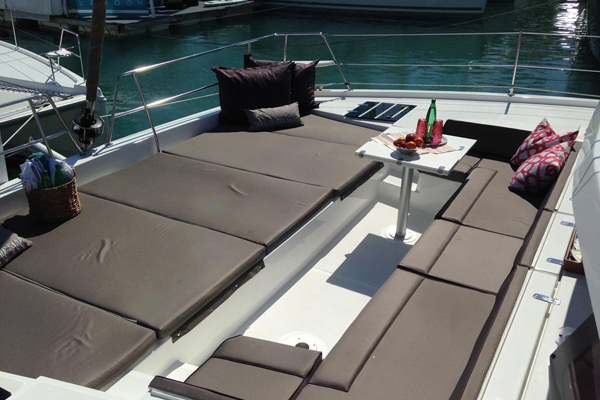 Guests get to enjoy a saloon, an outdoor lounge, and a sun bathing area to starboard. Cabins are comfy with their double beds, storage space and en-suite bathrooms with separate showers. They promise guests natural lighting and great ventilation for added comfort. So book your yacht safari with Mozambique Yacht Safaris and sail into the distance in comfort and luxury – this unforgettable experience is completely do-able with the assistance of our expert travel consultants. Choose your season according to what you want to see and do – migrating Southern Right and Humpback Whales pass by during June to December and you can catch glimpses of their new calves, close to the yacht! Spend time on board the yacht fishing – we are keen to host sport and fly fishermen who want to discover these pristine waters and the game fish beneath them. We can tailor make your charter to be a fishing one where you sail for four to five days, casting your line continuously and trying to land Kingfish, Yellowfin Tuna, Queen Mackerel, Queenfish, Dorado and Barracuda as well as Dogfin Tuna, Yellowfin Tuna, Sailfish, Black Kingfish and Ignoblis! Diving in the Bazaruto Archipelago is rated as one of the best experiences on any Mozambique holiday. Now international divers travelling to the warm Indian Ocean off Mozambique can explore one of the biggest marine conservation areas around from the deck of a luxury sailing vessel at Mozambique Yacht Safaris. You will be in the hands of expert sailors who will enhance your Mozambique holiday with yachting packages that include world-class diving in the azure seas around this string of six islands. Visit one of the most beautiful dive destinations worldwide with Mozambique Yacht Safaris and you will find yourself exploring kilometres of still untouched dive sites, pristine beaches and coral reefs. You can do this with the click of a button. Wake up to freshly brewed coffee and go snorkeling for hours in warm clear waters. Take a sailing trip to St Lazarus Bank – or Banco St Lazarus – the ultimate Mozambique diving holiday destination and one of the only places in the Quirimbas Archipelago where Marlin are known to breed. If you choose Mozambique Yacht Safaris as your companions and accommodation specialists during this unique Mozambique holiday adventure, you will be sure to sail with the best.